On Wall Street, in a volatile trading session, the Dow ended +9 points amid a positive Beige report and Feb ADP reports, overshadowing the 2.9% jump in oil prices to US$102/barrel as ongoing geopolitical tensions in Mideast spread to other oil producing countries. Crude drove through $100 a barrel following reports that a fighter jet fired two missiles just meters from a square in the Libyan town of Brega, a key oil storage export terminal. Federal Reserve Chairman Ben S. Bernanke signaled he’s in no rush to tighten credit after the Fed finishes an expansion of record monetary stimulus, seeing little inflation risk and still-slow job growth. A surge in the prices of oil and other commodities probably won’t generate a lasting rise in inflation, Bernanke told lawmakers in semiannual testimony on monetary policy. A “sustained period of stronger job creation” is needed to ensure a solid recovery, and the Fed’s benchmark rate will stay low for an “extended period,” he added. 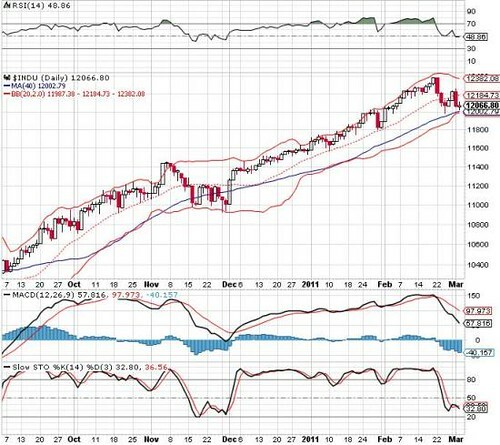 Dow Jones is consolidating as bollinger bands are narrowing.